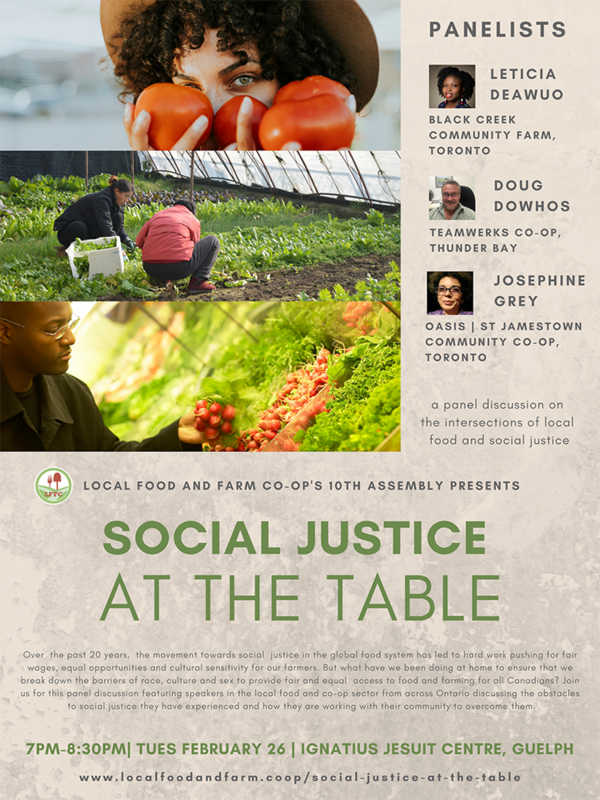 As part of the Local Food and Farm Co-ops 10th Annual Assembly, they are inviting the public to join their keynote panel on the evening of Tuesday, February 26, from 7 p.m. – 8:30 p.m. at the Ignatius Jesuit Centre in Guelph, Social Justice at the Table: a panel discussion on the intersections of social justice and local food. The event will bring together speakers from various parts of the local food and co-op sectors from across the province who will talk about the obstacles to social justice they have experienced and how they are working with their community to overcome them. The event cost $18+HST per ticket, and offers the opportunity to join LFFC for part of their 10th Assembly without committing to the entire 2 days. Purchase your ticket on the Eventbrite page here.